I thought this was awesome, we walked down in the old part of town with some friends and saw this boat in a little marina. 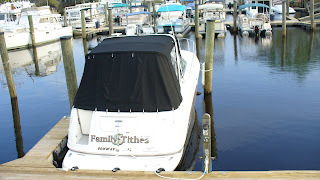 if you can't read it the name of the boat is "Family Tithes". I thought this was really cool! this is a sweet yacht that obviously this family thought to give glory to God on the basis of their tithing. I'm not proposing tithe to get a boat, but God did say He would open heaven and pour out soo much blessing we couldn't store it.